As parents, we love to provide homemade healthy snacks to our kids. But, it is difficult to spend more time on preparing a snack. For someone like me who doesn't enjoy cooking, the preparation time should be short. Here are 3 quick healthy snacks that I prefer to prepare any day which of course my kids love. Sometimes, it's better to look our traditional recipes when we think of a snack. White chickpeas are good for fiber and protein. 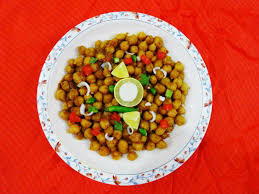 Here is the quick recipe which takes no more than 10 mins if you have boiled chickpeas ready. 1. Keep 1 cup of chickpeas ready after boiling and draining water. 2. In a pan, add one spoon of olive oil, add cumin seeds, mustard seeds, urad dal and let them splutter. 3. Add minced garlic and green chilli. After they are fried slightly, add chopped onions. Saute for a few mins. 4. After onions turn pale, add chopped tomato pieces, add salt and chilli powder. Cover the lid and let it cook on low flame for a few minutes until tomato becomes mushy. 5.Add boiled chickpeas, cook on low heat with lid covered. Add chopped coriander leaves, squeeze half a lemon. Check for salt and spice and add as per the requirement. This is a breeze to prepare and my kids always love it. There is no preparation as such. 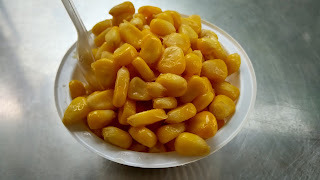 I boil sweet corn for 10 to 20 mins in water, strain them after they are cooked, add salt and pepper and serve. Usually, all kids love muffins. So, this would be a favorite at your home for sure. I used whole wheat instead of all-purpose flour to make it healthy. Here is the recipe. 1. Mix butter and sugar in a bowl well until sugar is dissolved. 2. In a separate bowl, beat 3 eggs with vanilla extract until it becomes pale and fluffy. 4. In a separate bowl, add wheat flour with salt, baking powder and mix it with grated carrot until it is evenly mixed. 5. Now, add egg and butter mixture to flour until it's smooth. No need to beat but we have to fold like we do for a cake batter. 6. Pour this muffin mixture into cupcake molds. Preheat oven to 350 degree Fahrenheit and then bake these muffin for 20 mins. Linking this to #MondayMommyMomments hosted by Deepa and Amrita. Image courtesy: Google images labeled with non commercial reuse. My son is a huge fan of sweet corn! These are great examples - quite filling ones too! Yes Amrita, carrot muffins are very delicious. Try it. My kids too love sweet corn anytime.